Chris Hedges is a Pulitzer Prize-winning journalist. He spent nearly two decades as a correspondent in Central America, the Middle East, Africa, and the Balkans, with fifteen years at the New York Times. 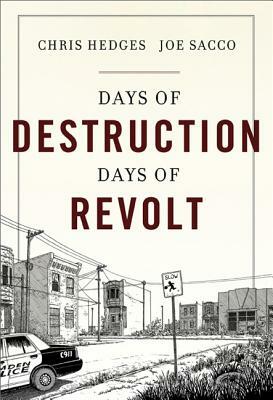 He is the author of numerous bestselling books, including Empire of Illusion; Death of the Liberal Class; War is a Force that Gives Us Meaning; and Days of Destruction, Days of Revolt, which he co-wrote with Joe Sacco. He writes a weekly column for the online magazine Truthdig. He lives in Princeton, New Jersey. Joe Sacco, one of the world's greatest cartoonists, is widely hailed as the creator of war reportage comics. He is the author of, among other books, the American Book Award winning Palestine, Footnotes in Gaza, which received the Ridenhour Book Prize, and Safe Area: Gorazde, which won the Eisner Award and was named a New York Times Notable Book and Time magazine's best comic book of 2000. His books have been translated into fourteen languages and his comics reporting has appeared in Details, the New York Times Magazine, Time, Harper's, and the Guardian. He lives in Portland, Oregon. "Hedges carries the mantle of Upton Sinclair, Howard Zinn, George Orwell, and all the agitators in fighting for the soul of nations when so many have forgotten what that means. His eloquence is in the eloquence of the lives he presents, and Sacco lovingly animates them. It's rare that a book carries so much courage and conviction, forcing reflection and an urge to immediately rectify the problems."